Do you know what your calling is? It is notoriously difficult to discern one’s calling, which is to say, ‘how do I know what God wants me to do with my life? There’s the kind of calling which is “Calling-with-a-Capital C’. This ‘Capital-C-Calling’ is the kind that happened in the Old Testament, the kind that most of us hanker after because it’s reassuringly supernatural. The formula is thus: an angel shows up (or a clear prophecy is given); there is due protest that they’re not articulate enough (Moses), not important enough (Gideon) or just that they don’t want to do it (Jonah). They then do the job, because even though they’re weak, God equips them. Then there’s the other understanding of how you find your ‘Capital-C-Calling’ which is seen more in the New Testament. This is serving according to the gifts God has given you (Rom 12:6-8): ‘if it is teaching, then teach; if it is to encourage, then encourage’, and so on. At theological college, people seemed to split into two groups, depending on whether they appealed to the Old Testament or New Testament understanding of ‘Calling’. One set of people were keen to emphasise how unsuited they were to Christian ministry, explaining that that’s how they knew that God had called them. (In actual fact, most were very well-suited to Christian ministry). They saw their calling in the same pattern of this Old Testament-style ‘Capital-C-Calling’. Conversely, there were also some in theological college who were keen to emphasise just how gifted they were and how well-suited they were to ministry. This caused some consternation to the ‘I know I’m called because I’ve fought God about this’ camp, but actually both sides were just using their biblical understanding to justify their sense of calling. And both sides felt a strong calling to ministry, though they expressed it in different ways. I have never had a voice from the sky or prophetic word, though that would have been nice. However, along the lines of the ‘New Testament understanding’ of calling, I have felt very strongly called to full-time Christian ministry. This is because I saw the need for it, people said I was good at it, I wanted to serve God and perhaps most of all – I LOVED it! I loved studying and teaching the Bible, I loved answering people’s objections to Christianity, I loved listening to people who were going through hard times and offering them Biblical perspectives. And that was the case for the last decade – I was in the privileged position of getting paid for doing what I loved most; working for a church and co-leading a theological training course, alongside my husband. But here’s the thing. In the last year or so that has changed. A positive change (my baby being born) and a negative change (major health issues) have resulted in me being almost entirely housebound and having to significantly limit the time I spend talking to people, writing or reading. For the past year and a half, I have spent the majority of my time on my own, at home, looking after my baby for as much of the day that I am well enough to. Although I dearly love my baby and am profoundly grateful for the chance to be a Mum, I never felt ‘Called’ to be a stay-at-home Mum. I am an extrovert; I feel energised and alive by being around lots of people – but I now find myself in a situation where I am alone much of the time. I am an active person and love running – but now I find myself unable to walk more than a few paces. I love having dinner parties, and offering hospitality; but now talking for more than a couple of hours exhausts me. I am a planner and strategic thinker; and now can only make plans for a few days or so ahead of time. I feel like I’m not doing what i’m supposed to be doing. I am a right-handed person. This way of being feels like ‘writing with my left hand’. It does not come naturally. It is hard, it takes much more effort. It is frustrating and wobbly and shaky. It does not look very good. I could do much better with my right hand. I feel like God’s got it wrong. He should know that this is not the most efficient use of my time. He should know that I could be much more useful to Him and His Kingdom as a healthy person, able to use my gifts for His glory. Nevertheless, this is what God has called me to do. For today, I am called to get up, change nappies, read fairy tales, do relaxation exercises, lie in bed. I know this, not because I have had an angelic message, and not because it is something I am particularly gifted in, but becuase He is Sovereign and this is the situation He has put me in. I suspect that this is the case for most people; that the life they lead is not necessarily the life they feel Called to. Wonderfully sometimes we do find ourselves in a position where our careers and family situation fit perfectly with our gifts, passion, personality – but this is quite rare, and God is quite able to work out His purposes without this. This is not God’s ‘Calling-with-a-Capital-C’, but it is still God’s calling. It is not what we think God wants us to do with our lives, but it is what He is actively doing with our lives. I must not make such an idol of my ‘Calling-with-a-Capital-C’ that I miss my actual calling; what God has asked of me here and now. For now, He has called me to an existence of left-handed writing. I want to be obedient, and I dare to hope to be joyful in it. Do you think you have a ‘Calling’? How do you go about discerning such a call? 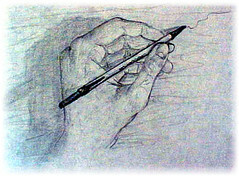 To what extent does your life feel like ‘left-handed writing’? I found your blog inspiring, challenging, moving and eye opening. Inspiring because of your acceptance of living life ‘with your left hand’ without challenging God or feeling sorry for yourself (both understandable). Challenging because at times I find my ‘identity’, in my being ‘a families worker’ rather than just being a human created and loved by God. I love my job, but at times I recognise that I also love the ‘status’ my job gives me within the church, the community and even my family. This is a reminder to me that whether I’m doing what I’m called to do or not, my identity is in ‘being loved by Jesus’, just for being me! My job or calling should never be my ‘idol’. Moving and eye-opening for the same reason. I learned about you, and about your illness. I felt you let me have a peek at the reality of your day to day life. Your dignity and faith came across and spoke directly to me. Wonderful, I can’t wait for the next blog!!! Thanks so much for your encouraging words. (I do feel the need to clarify that I have both challenged God and felt very sorry for myself!!) But in a more accepting place now. I think in Christian ministry it can be really tricky and confusing to remember our identity in Christ rather than our minstry – it’s definitely a challenge. Occupational hazard?? Yes it is an occupational hazard! So, rather than thanking God for calling me, should I rather be thanking God for blessing me with a position/job I love?….or maybe perhaps both? The line, ‘I want to do Your will no matter what it is’ is often a big ask, but we’re following one who did exactly the same Himself. ‘Your will, not mine’. As for calling, my problem is that I’m too easily called. We watched ‘Wild at Heart’ last night, and I was called to Africa. It’s that easy. The best was probably when I saw a Mish Kid back from Cyprus, and I felt immediately called to Cyprus. I think it was his mighty fine tan that swung it. I therefore have to work hard when I think I’m called to something, to try to work out whether I’m calling God to follow me, or whether it’s actually the other way round…15 years ago, I didn’t expect to be doing 10 years ago what I ended up doing. And 10 years ago, I didn’t expect to be doing what I’m doing now. I think the ‘now’ bit feels more left-handed than 10 years ago though! Thanks for your wise comment, Nick. Thanks for the song lyrics – you’re right, they’re great, and they really get under the skin. I LOVE that you’re called to Africa after watching TV! Before I answer (or at least try to), a couple of (hopefully positive) thoughts on your post. 1. Do we assume that God should use us in the most efficient way for Him and His Kingdom but fail to see that perhaps the calling God has on our lives, right here, right now Might be about our own journey to full maturity in Christ? That is to say, is it possible or conceivable that God will nurture and develop us in ourselves to make us the person he wants us to be, mentally, spiritually and emotionally? It can be hard to see what God’s purpose is in our calling (and with your calling – how hard and tough it must be), particularly when we are outward looking people, if God is actually shaping our heart to be like his. I guess we can ask some questions in light of that (and be warned asking the questions may make us angry with God). Will the experience I am going through / calling I have make me need to trust God more? Will it give me more of a heart for the needy or an overlooked undervalued section of society? Are there people like me, who need Christ but for whom it isn’t as easy as going to church? I have and always (I think) will struggle with my calling, I’ve tried things, I’ve looked under every stone I can think of – I’ve looked to see what it might be. I’m not sure it can be to go and taste wine everyday (nice though that would be) surely there is something else I ought to be doing – and so I try doing – and find that circumstances, work, my own ability to do things stop me doing things. Perhaps I lack persistence but it feels like I’m forever trying to do things that might be part of my calling but never manage to follow through. At times that can make me feel like a loser, but then I’ve always been to churches and had friends who are cleverer, more articulate and more servant hearted than I am (although I also have ‘issues’ having been in Oxford with really clever people for so long and not being a clever person I probably over do the not clever bit). Thanks Tim, especially for your thought-provoking questions. I feel a little uncomfortable about your first question, which implies that God is more concerned about our maturity than our fulfilment. I am uncomfortable about it because I think it is true! It doesn’t necessarily make the process any easier to experience, as you say, but it is good to be reminded of that. I’m was quite surprised to hear your thoughts on your own calling, simply because I see you as someone who has that quite sorted – you seem to me to have a great balance between ministry stuff, career/serving others/being in the world stuff and family stuff – and that is no mean feat! I suspect that appearances are deceptive, and that none of us are anything like as sorted as we appear to other people to be – which is where thought provoking discussion is really useful and helpful – it brings out into the open that we are not alone in what we feel, that others feel the same – perhaps that means it is normal to think these things if we’re seeking after the Lord’s heart – and we will only do that if we’re doing things right – so as with many things of the Lord – when we struggle it is because we understand. Briliant honest post. I love the reflection on the two callings (big C, little C). Very insightful. I guess I am in both camps – understanding I have a ‘C’alling to be a Pastor, but also recognising the ‘c’alling in the everyday situations, circumstances, environments, communities etc I find myself in. Both come with their own challenges – but for me – it’s about keeping the balance right. I would never want to forsake my ‘c’alling – the hear and now – for the sake of the ‘C’alling in the future. In fact, when broken down, I guess I see it as though the ‘c’alling will eventually lead into a better understanding of, and fulfillment of the ‘C’alling. I have been blogging a bit about my Calling – which I think demonstrates the living for the now at the same time. If you’re interested – it’s the ‘coming out’ series at http://www.joroyal.com. Thanks Jo – and have enjoyed reading your ‘coming out’ journey on your blog. I look forward to the next installment! Welcome to the world of blogging! Very good to have you in these parts. Thanks for the post as well. I guess I have a whole load of questions about the idea of calling. Jon Acuff (genius mind behind Stuff Christians Like – which you should check out if you haven’t already!) has a theory that we often live with a ‘I do ….. but I really want to be a …’ and has written a book on helping you finally do your dream job. I have a few suspicions about that method. I’m just not convinced that life is as straightforward as saying here’s my passion, I will now make my life about finding a job that reflects that passion. I’m not sure we get to do what we want to do all the time. And that leads me to a whole load of questions. What if we never do the job we’d love to be doing? We might have given up on that for someone else, (I’m guessing that doesn’t fit so much with the sightly self indulgent nature we can slip into, of worrying about where our lives are going so much that we fail to look around to the people around us who need help). Should passions always be worked out in jobs? Is that a luxury? Where are we self indulgent about finding our ‘calling’ or geniunely looking to serve God as best we can in the place we are with the stuff he’s given us? Maybe He puts us on the left handed path for a while/our whole lives so we learn what it is to depend on him, so the things that come naturally to us don’t become sources of pride, I recognised recently that I was settling down to quickly write a bible study with no thought to prayer, just a sense of lets get on with this. I can’t sit down at my desk at work without praying so far because I feel out of my depth and in the wibbly world of left handed writing. Maybe God wants to develop ambidextrious skills in me. How much do we know what we should be doing (loving and being loved) and how much of life is working out the opportunities to do that in whatever frustrating circumstances we are in right now. Who knows. There is much I’m in the dark with when it comes to stuff like this. I’m not sure of the answers….Just a whole load more questions. But I kind of like that, it would be sad if we had life sewn up right now! Hi Tanya, thanks so much for your post – I hope you’re enjoying your new blog so far! 🙂 I think I’ve come to realise over the past year or so that God calls us in different ways, and uses exactly the things that we are good at and, amazingly, the things that we love doing in “calling” us to whatever we’re doing in life. But also like you say, that he has complete control over where we are now so we are called to be there too, even if it’s not a place that we’re completely loving. Apparently Jim Elliot said “Wherever you are, be all there” which really resonated with me when I was living in Belgium and working in full time Christian work for a year. As did Acts 17v26-27: “From one man he made all the nations, that they should inhabit the whole earth; and he marked out their appointed times in history and the boundaries of their lands. God did this so that they would seek him and perhaps reach out for him and find him, though he is not far from any one of us”. Thanks for taking the time to reply! I love the Jim Eliot quote – will ponder that. Really interesting read, thanks Tanya! I would guess that on the outside I would appear to be one of those very lucky people who is doing what they feel they were always called to do. You know well of my passion for aviation and flying, and I feel God has allowed me to use and enjoy my talents as a pilot. However, at times I regret that fact that I have had to move so far from home and much of my family to pursue this career. God has blessed me with a wonderful wife and a great job, but at times it feels as though it does not fit into the image that I had in my head of what I felt I was called for. I never expected to live in the USA. I had always thought that God wanted me to stay in Oxford, going to St Andrews every week while working as a pilot. His calling was obviously a little different. But different is still good and I feel so blessed to be doing what I love in a country where I get to meet so many great people and where I am free to worship the one true God. I see evidence of Him every day at work and I thank him for my calling, even though it is not always as I had planned! In fact, when I have tried to manipulate my own path, things have often gone wrong! I still hope to return home one day, but until then I am at peace with where I am and the many wonderful blessings I’ve been given. HI Tanya. Thanks so much for your blog entry – I found its honesty refreshing and so much of it resonated with me. I love both of my children dearly, but have never felt like a ‘natural’ mum. I think that contributed a lot to my postnatal depression, which I experienced badly with both. I am an editor and writer, worship leader, pastor’s wife, school governor etc – ie highly organised, motivated and busy busy busy! I think suddenly being stuck at home with someone who couldn’t talk, along with feeling totally out of control, made me lose my footing for quite a while. And, if I’m honest, I’m not sure I ever got to the place I should have within that situation. But it also taught me a huge amount about who I am, and where I get my sense of self/purpose etc from. I’m now at the stage of both kids at school/pre-school and my writing/editing has picked up again so I’m doing the juggling act – and loving it! 😉 Sometimes it is far too hairy and I feel I’ve bitten off too much and worry that no area of my life is getting the attention it serves. However, most of the time I’m just so glad God has blessed me not only with beautiful children (that test the limits of my patience and show me my own character flaws more often than not 😉 ) but also with opportunities to use the talents and gifts I truly believe he has placed inside me. thanks so much for taking the time to comment – great to hear a bit about your story!